Jedi Master Di and rebel leader Cham Syndulla formulate their battle plan in “Supply Lines,” an all-new episode of STAR WARS: THE CLONE WARS premiering at 9:00 p.m. ET/PT Friday, September 24 on Cartoon Network. Trademark information for Star Wars: The Clone Wars images: TM & © 2010 Lucasfilm Ltd. All rights reserved. Ryloth is under siege. 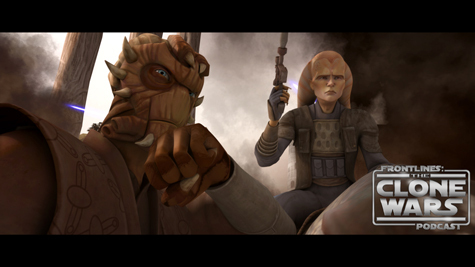 Trapped on the surface, Jedi Master Di rallies the local forces with the help of rebel leader Cham Syndulla. Desperate to save them, Senator Bail Organa and Representative Jar Jar Binks are dispatched to the planet of Toydaria, where they must convince the King Katuunko to send aid to Ryloth – before it’s too late. Taking place before Yoda’s fateful meeting with King Katuunko on the moon of Rugosa – chronicled in the series premiere episode, “Ambush” – “Supply Lines” sheds light on some of the dramatic events that forged The Clone Wars. It also explores the origins of the Ryloth occupation and the subjugation of the Twi’lek people occupation, explored in the first season’s two-part season finale. “This conflict is vast, to say the least,” says Filoni. “It’s a big galaxy, and there’s a lot going on at all times. Even two seasons in, we’re only seeing a fraction of the war – key moments that are really focused on the primary heroes from the films. But those moments are framed by heroism and villainy, too, just as there are important events happening concurrently with the key scenes we’ve explored. Serving to support existing stories and to build on the overall mythology of Star Wars: The Clone Wars, “Supply Lines” nonetheless promises its own action and surprises. Featuring the return of some fan-favorite characters from the live-action films, the episode also introduces some brand new characters – such as Jedi Master Di. “We’re going to meet Jedi Master Di,” says Filoni. “I like him a lot; he’s cool and I’d like to be able to do more with him. But you should remember that this is a prequel, and that it takes place before the episodes we’ve seen already. There may be a reason we haven’t seen him after the events of this episode. Here’s a hint: Star Wars characters have a history of suggestive names. Greedo was a greedy bounty hunter. Lobot’s a guy with a computer implanted in his brain, like a lobotomy. General Grievous and Darth Maul are both intent on causing pain and suffering. Han Solo’s a loner.